What’s better than discovering great music? Discovering it’s free as well. Cheap and Cheerful intermittently throws free downloads your way for continued listening pleasure that doesn’t break the bank. Seen most recently supporting neo-soul Q.U.E.E.N. and fellow Atlantan Janelle Monae on tour, Cody ChesnuTT has also been carving out his own distinctive brand of rock ‘n’ soul in recent years. After splitting from L.A. rockers The Crosswalk in 2000, ChesnuTT set up a makeshift studio in his bedroom and sequestered himself for several months with a handful of instruments and a 4-track recorder to produce 2002’s critically acclaimed double album The Headphone Masterpiece. A genre hopping gumbo indebted to a love of rock ‘n’ roll, The Headphone Masterpiece turned a lot of heads with its prodigious musicality and lo-fi aesthetic, landing ChesnuTT on tours with Erykah Badu and The Roots. A subsequent guest slot on The Roots’s Phrenology for their cover of ChesnuTT’s ‘The Seed’, an appearance in Dave Chapelle’s Block Party and electrifying live performances only added to his growing cult status, yet ChesnuTT would not put out his second full-length album for another ten years. Following a quiet period of family life and reflection, punctuated by the release of Black Skin No Value EP in 2010, ChesnuTT returned with the smoking hot Landing On A Hundred in 2012. True to his bedroom basics roots, ChesnuTT has now chosen to make the Kickstarter funded album available for free over at Noisetrade, parcelled up with guest remixes and juicy outtakes from recording sessions at Memphis’s Royal Studios. Landing On A Hundred is out now through Vibration Vineyard/One Little Indian and is available for free download here. 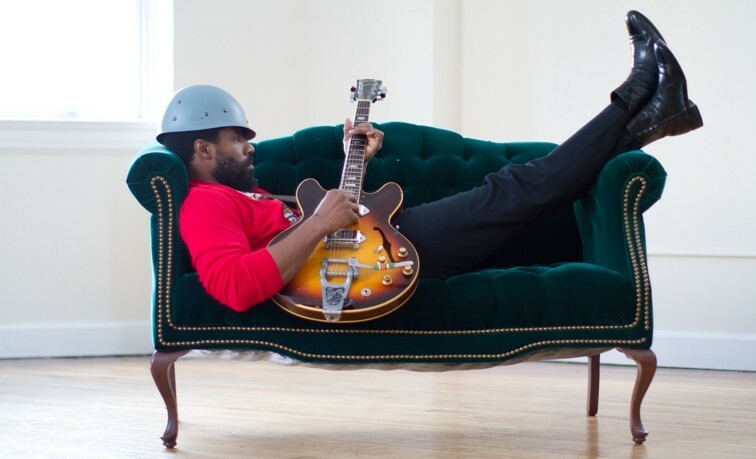 Cody ChesnuTT is currently on a European tour, find dates here. A friendship born on Late Night with Jimmy Fallon where The Roots have served as Fallon’s house band since the show’s premiere in 2009, Elvis Costello and Questlove (The Roots’s drummer and co-frontman) are set to release their full-length collaborative LP, Wise Up Ghost, tomorrow. The odd-couple, much? Probably, but looking at their respective career trajectories, Elvis Costello and Questlove have a lot in common. Both have been slow-burners and neither have shied away from making unpredictable career moves or bothered making distinctions between what their music should or should not be about. Also, neither have qualms about letting their social opinions known on record: The Roots have recorded challenging albums commenting on social inequality and dissatisfaction in America on albums such as Things Fall Apart and Rising Down, while Costello’s protests range from the furious (‘Radio Radio’, ‘Tramp the Dirt Down’) to the beaten down (‘Shipbuilding’). It is fitting then, that some songs on Wise Up Ghost grew out of reworking some of Costello’s angriest songs (‘Stick Out Your Tongue’ came from ‘Pills and Soap’) and that ‘Walk Us Uptown’ should be an equal meeting of Costello’s admonishments and Questlove’s musical sensibilities. The album’s cover art being presented in the distinctive style of the old City Lights pocket poetry volumes is not fanciful, as ‘Walk Us Uptown’ very much has the feel of a modern beat poem. The traditional jazz accompaniment has moved on to encompass hip-hop and rock and roll and it feels like natural continuation of where Gil Scott-Heron left off with his final volume, I’m New Here. Jarring samples and punk staccato guitar punctuate the mix, while Questlove’s drumming is busy yet downplayed. Rather than a lively beat it is a monotonous shuffle, simmering with the same malice as the beat on Grandmaster Flash’s ‘The Message’. This sense of unease is heightened by the edgy piano chords which permeate the track and the sound of a distant train fading in and out. Meanwhile, the world view of ‘Walk Us Uptown’ remains as bleak and apocalyptic as anything Allen Ginsberg or Amiri Baraka saw, full of degradation and barely suppressed fury. Costello has been long recognised as a wordsmith and here he sounds like a man reading out newspaper headlines, an endless litany of frustration and bile which is broken only occasionally by the refrain “Will you walk us uptown?”, which sounds more like a demand than a question. This is anti-easy-listening music. Disguised behind ‘Walk Us Uptown’s catchy and listenable veneer, lies a challenging and troubling core, which Ben Greenman articulates when musing on Wise Up Ghost‘s title in his ambitious introduction to the album: “Often, [ghosts] are spirits left behind because they failed to demonstrate the appropriate acumen in life. Are we now, as a species, risking this kind of nightmare? Can we learn enough to prevent a purgatorial future?”. This is a tall order to fill, but, like the best of any art form, ‘Walk Us Uptown’ does not present answers. Rather it provokes questions in the consumer and, hopefully, we may derive some answers for ourselves. Wise Up Ghost is available in record stores tomorrow through Blue Note Records.